1. 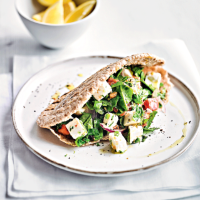 Cut a thin slice from the top of each pitta and open to create a pocket. 2. In a large bowl, mix the remaining ingredients and season with black pepper. 3. Warm a griddle or non-stick frying pan over a high heat. When hot, press each stuffed pitta firmly down onto the pan for about 1 minute on each side, in batches, until warmed and golden.